Climate Heroes is a non-profit multimedia project and educational essay for the public, which gathers worldwide stories of men and women, citizens, scientists, media, politicians and entrepreneurs who have started acting to elevate consciousness about, mitigate, or understand Climate Change. By the positive examples they provide, we trust they can inspire the great many to start mitigating climate change with small daily acts, or larger endeavours. 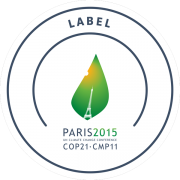 Climate Heroes is an independent non-profit registered in France. Offer the public a novel vision on climatic issues, more readily accessible through examples taken from a wide range of stakeholders, be they professional or citizens. Provoke thought, inspire and foster behavioural changes and by doing so, we are carrying a strong and positive message. Who are the Climate Heroes and what do they do? Climate Heroes come from all walks of life. From a local village activist to a globe trotting scientist. A respected religious figure to a youth educator. All are very different and from varied backgrounds, but all of them fight to mitigate Climate Change in their own way and ultimately have the same goal: to preserve and improve the natural environment around us. By shedding the light on those men and women who stand out by their values and actions to help mitigate Climate Change for the wealth of all, and by giving them a platform to voice their thoughts and experiences, we want to introduce them across the globe. So, as inspirational models for the rest of us, we can all learn from them. The climate change initiative must be innovative. The initiative must demonstrate positive climate change impacts. The scale and relevance of these impacts in a local context is taken into consideration. The positive climate change impacts must be sustainable over time. The person must understand how climate change affects them / their organisation and how they / their organisation influence climate change. Yet, ultimately they must be inspiring. Passionate people who will spread their knowledge, their issues and their voice on the one issue that is affecting all of us. Max is a French adventure and travel portrait photographer, and the founder of Climate Heroes. Based in paris and Montreal when Max is not undertaking commercial assignments for clients around the world he is directing the Climate Heroes team. He founded Climate Heroes because he cares about our world and wanted to inspire others to help mitigate climate change. Luke is a multi-award winning documentary photographer and founding member of Climate Heroes based in Bangkok, Thailand. He has worked for and been assigned by such clients as National Geographic Magazine, The Smithsonian Magazine, The New York Times and the The Guardian UK. When he is doing undertaking commissions he is working on personal projects around the globe.